Xiaoji Xu, an assistant professor in the Department of Chemistry at Lehigh University, has been named a Beckman Young Investigator, earning a prestigious grant awarded by the Arnold and Mabel Beckman Foundation for "the most promising young faculty members in the early stages of their academic careers in the chemical and life sciences." Xu is one of only ten 2018 Young Investigators named this year nationwide. The Young Investigators program is specifically focused on fostering the invention of methods, instruments, and materials that open up new avenues of research in science. Xu will receive $600,000 over four years to support the development of an infrared microscopy technique that bypasses the two current limitations of the current method: low spatial resolution due to the diffraction limit and incompatibility with the aqueous phase measurement due to the strong infrared attenuation from the water. The goal is to achieve infrared nanoscopy in the aqueous phase for a range of chemistry and biology applications. According to Xu, the new technique will empower researchers to study previously inaccessible nanoscale objects, as well as chemical reactions and biological processes in the aqueous phase with an unprecedented spatial resolution. 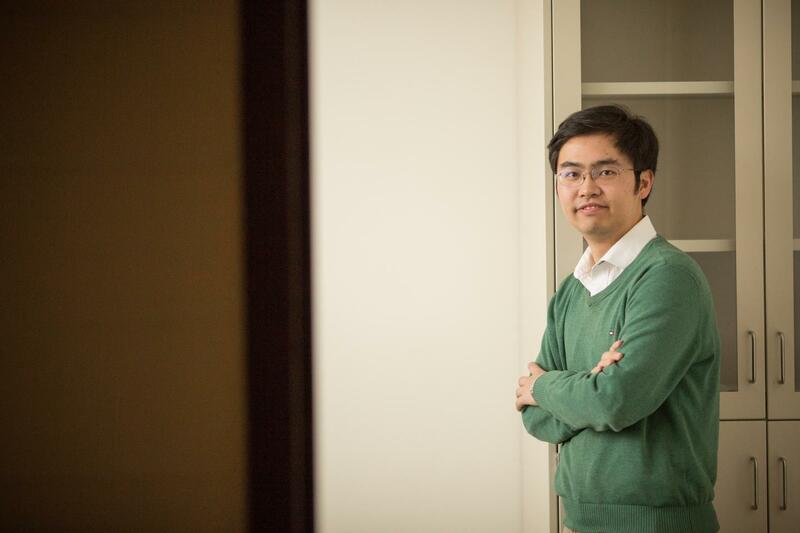 "The support from the Beckman Foundation will elevate my research to the next level, towards label-free super-resolution imaging in the liquid phase, where many important chemical and biological processes take place," said Xu. Added Gregory Ferguson, Chair of Lehigh's Department of Chemistry: "Xiaoji's proposal to develop an infrared method that provides high spatial resolution in aqueous media represents a significant advance that would be useful in a wide range of applications. This prestigious award confirms the opinion of those who know and work with him here at Lehigh University: he exemplifies the creativity and rigor valued by Arnold O. Beckman, one of the namesakes of the granting foundation, when he said 'There is no satisfactory substitute for excellence.'" Xu and his group have contributed to the field of nanoscale infrared radiation microscopy with the development of peak force infrared (PFIR) microscopy. PFIR microscopy is a simultaneous infrared radiation and mechanical technique at sub 10 nanometers spatial resolution. Now, they will look to extend the PFIR technique to operate in water, filling a need for a sensitive and non-invasive aqueous phase infrared radiation microscopy method. Aqueous-phase PFIR microscopy, says Xu, has the potential to be a transformative analytical chemistry tool for a wide range of research areas in chemistry and biology. "It will be particularly useful for chemical materials and small-scale biological systems that are not fluorophore-label friendly and to which current super-resolution fluorescence microscopies–such as STED, PALM, STORM–cannot be applied," adds Xu. The Xiaoji Xu Research Group has demonstrated high-level expertise in developing new imaging instruments methods. They develop spectroscopic microscopy techniques to study macromolecules, heterogeneous materials, and nanostructures to decipher their chemical, electric, and mechanical properties. For example, their recent near-field mapping technique of peak force scattering-type near-field optical microscopy enables tomographic access to the optical near-field of polaritonic materials as well as multimodal characterization.